Whenever operations at Saipan’s casino hit a snag, Edward Concepcion DeLeon Guerrero and the Commonwealth Casino Commission are there to investigate. DeLeon Guerrero’s role as the executive director of the commission essentially puts him in the hot seat; people look to his authority for every bit of concern or complaint related to Imperial Pacific International’s multi-million dollar casino. But it’s a task he knew he could take on. “I saw this as a unique challenge and an exciting opportunity to help steer this new casino gaming industry in the right direction for the [Northern Mariana Islands]. My previous occupations were in law enforcement with a heavy emphasis in regulatory activities,” he says. His résumé speaks for itself. 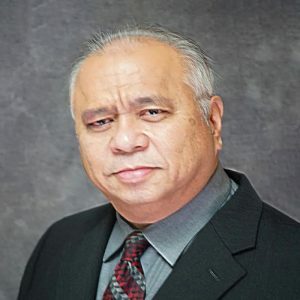 DeLeon Guerrero has more than 30 years of experience playing either a supervisory or regulatory role across several government agencies and companies in the private sector. Prior to his position in the commission, which began in January 2015, he was president of Cornerstone Consulting Services, director of courts at the Commonwealth Judicial Branch Supreme Court and chief of customs for the Department of Finance Division of Customs Service. He has worn other hats in the same field since he earned his master’s degree in public administration from Boise State University in 1984. With all this experience, he manages some 50 employees at the commission and serves as counsel to the appointed commissioners. DeLeon Guerrero says he is particularly passionate about this role because he firmly believes that casino gaming is a positive revenue source that will help the NMI flourish. DeLeon Guerrero acknowledges that others may not be as optimistic as him, and he says he is hopeful that once the casino and its accompanying hotel are complete, people will begin to see the extent of the positive impact the industry will have on the islands. That is not to say he is not cautious of the casino operations. As a regulatory agent, DeLeon Guerrero polices any and all transactions related to the casino to ensure no foul play, corruption or illegal activity. However, he says there is a public misconception that the commission is responsible for resolving every issue with the casino, even ones initiated by IPI. This is not the case, he says. His effort to make sure the casino remains a positive investment to the NMI aligns with his overall goal of bolstering government operations so that public services, education and infrastructure are up to par and the islands can move forward in a self-sustainable motion. In addition to his government role, he is the co-founder of Saipan Farm & Garden, a commercial farm he started in 1996. DeLeon Guerrero grows and sells fresh vegetables, fruits and assorted agricultural produce, balancing his work life with a lifelong hobby. He is also the co-founder of the Saipan Sabalu Farmers Market. “I’ve always had a hobby for farming,” DeLeon Guerrero says, reflecting on his younger days when his family would raise chickens and pigs in the backyard. Nowadays, he makes time to farm on the weekends. His farm had an abundance of produce, including eggplant, okra, sweet potatoes, soursop, avocados and mangoes, but much of that had been destroyed by Super Typhoon Yutu. It’s unfortunate, he says, but he’s set on rebuilding the farm to get it back in shape. When DeLeon Guerrero is not in the office or on the farm, he’s out in the ocean. Occasionally he can be seen on a boat bottom fishing — a hobby he used to do frequently in his younger years. He is also a certified scuba diver, so it’s not difficult for him to find something recreational to do in the waters. “It’s a real stress reliever,” he says.